Neon Indian(Dj Set) en el "1015 Folsom", además Teen Daze, Kuedo y Yalls en vivo en San Francisco, CA el Viernes 21 de Septiembre, 2012 las puertas se abren a las 21:00 hrs. se pronóstica que terminará a las 3:00 hrs. Mostrar mapa / View Map. Neon Indian is a chillwave band from Denton, Texas. The group is the current project of musician Alan Palomo, also known for his work with the band GhostHustler and as the artist Vega. The group has released two albums: “Psychic Chasms” (2009) and “Era Extraña” (2011). Pitchfork Media also listed two tracks from Psychic Chasms in their list of The Top 100 Tracks of 2009. Should Have Taken Acid With You was listed as the year’s 74th top track and Deadbeat Summer noticeably came in at number 13. Kuedo’s acclaimed “Severant” (Planet Mu, 2011) is about to get an EP sequel. “Work, Live & Sleep In Collapsing Space” (the song) comes from the same sessions the LP resulted from, something that’s also reflected in the artwork. The tune is described as an “emotionally epic, dance-floor detonator of a track”, built with “huge symphonic synths, half-speed kicks, trap-style hi-hats, rushes and flammed 808 snares” that end up in a synthetic field halfway between trance and Giorgio Moroder’s computer disco. The release is completed with remixes by Laurel Halo and Claude Speeed. From the haze of the Easy Bay comes Dan Casey aka Yalls melding funk, pop, & ambient elements to create electronic music that was described by Altered Zones as “zonked-out beat-folk” and as “weirded-out pop gems” by Smoke Don’t Smoke. Yalls’ 2011 self titled compilation tape on Two Michael Jordans & follow-up single on Crash Symbols showcase Casey’s eclectic style & warped production skills while highlighting his pop sensibilities. In addition to a steady stream of new songs, Yalls is also gaining notoriety for his remixes & collaborations with other East Bay musicians. Noted for high energy and cosmic visuals, the Yalls live show relies on looping synths and highlight Casey’s vocal stylings. 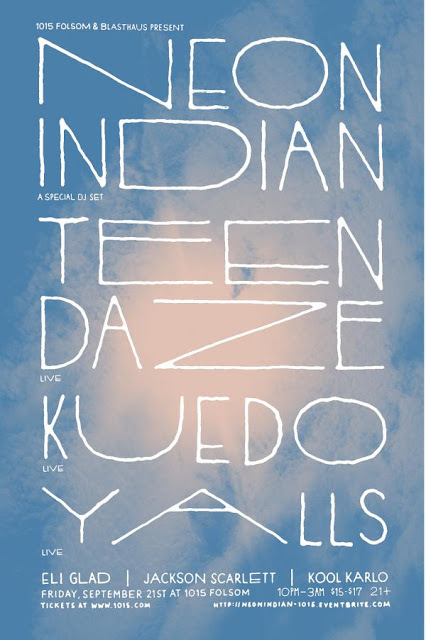 Yalls has fittingly shared stages with Teen Daze, Adventure, & Blackbird Blackbird, amongst others. Compra tus Boletos click aquí / Buy Tickets. Para más información / More Info.